Do you attract mosquitoes? I am very prone to mosquito bites, maybe because my blood is sweet or my body temperature is just right for the blood sucking creatures? I won this Esmeria Organics Prickly Pear SOS Rescue Cream a few months ago and have been putting it into good use especially at night. As I am writing this post, I can feel the aftermath of the mosquitoes' attack - very itchy skin. So, I stop for a while and apply some SOS cream. Active ingredients: Australian tea tree oil (fight bacteria), aloe vera (soothing), Portulaca extract (healing). The combination of the active ingredients helps to reduce inflammation and promote rapid recovery. This is the most handy SOS cream for mosquito bites that I have ever come across so far. I am so happy because this is an organic product with ECO Cert. 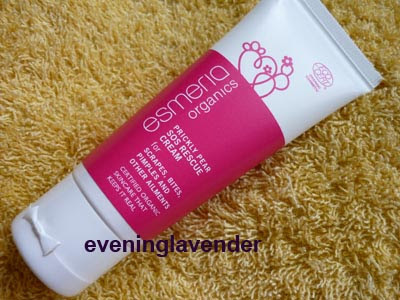 I am also very proud to say that Esmeria Organics is a high quality Malaysian product. Hope they can create more products. Let's support them.